By the champions Eukarpios and Trophimos. 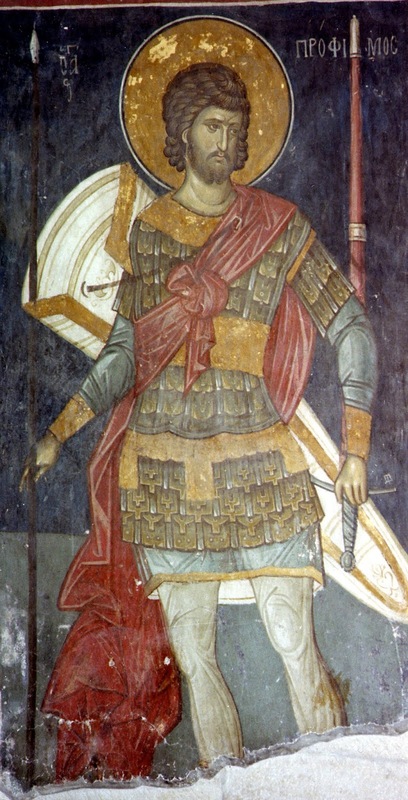 When a persecution against Christians ignited in Nicomedia, during the reign of Emperor Maximian in 298, many Christians were captured and imprisoned. After they were interrogated with many examinations and punishments, those who remained till the end in their confession of the faith of Christ, were put to death. 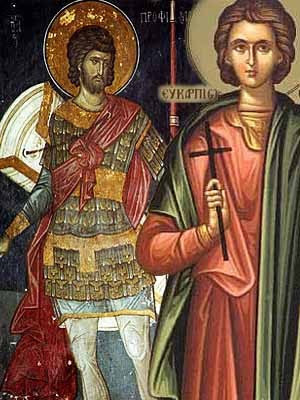 At that time were also the Martyrs of Christ Trophimos and Eukarpios, who were at first powerful and daring and part of the imperial army, through which they were persecutors and extreme enemies of Christ and Christians, and they would gathered up Christians and imprison them. They had reached the point where the tyrants gave them all authority against the Christians, and whoever they wanted they punished, while they took care of whoever they wanted as well. One day as they went to capture some Christians, they saw a fiery cloud, which appeared like a great fire coming down from heaven upon them, and they heard a voice that said to them: "Why do you rush to go terrify my servants? Do not fool yourselves, for no one can have authority over those who believe in Me. Instead, adhere with My servants, and you will gain the Kingdom of Heaven." When they heard this voice, those who were once bold and savage and boasted being against the Christians, now fell to the ground, and were not able to lift up their eyes to see, nor could they withstand the thundering voice from heaven. Looking down towards the ground, they said: "Truly God is great, Who has appeared to us this day, and we also want to be blessed, and to stand equally with His servants." As they were saying these things with fear and trembling, the fiery cloud divided in two, and each stood on either side of them. Then a voice once again came to them from the cloud, saying: "Rise up, and since you repented of your error, behold your sins are forgiven you." As they rose up, they saw a beautiful man dressed in white, sitting in the midst of the cloud, and before him stood a large crowd. Astounded by this vision, they said with one voice: "Accept us also Lord, our transgressions are many and immeasurable, for we despised You, the only true God, and we dishonored the Christians who believed in You." The soldiers having said this, the cloud once again became one, and ascended to heaven. After this they wept much for their prior error and cruelty, and having supplicated God, they turned back. As many Christians as they found imprisoned, they helped banish all fear and timidity in their hearts, embracing and venerating them like brothers, and having loosened them from their bonds, they told them to go back home. When the ruler learned of this, he was greatly enraged against them, and ordered that they be brought to stand before him. As they stood before him, he asked them questions to find out the cause behind their change. When they narrated to him in detail the vision that they saw, the ruler ordered for them to be suspended up on a spike, and to have their bodies beaten with bare hands. Then he ordered to have their wounds rubbed with hair garments. The Saints bravely endured these torments, prayed, rejoiced, and thanked God. The ruler, seeing them rejoicing, ordered for a furnace to be lit in the middle of the city of Nicomedia, and for the Saints to be cast within. When this took place, the blessed ones delivered their souls into the hands of God, and they received unfading crowns of martyrdom.